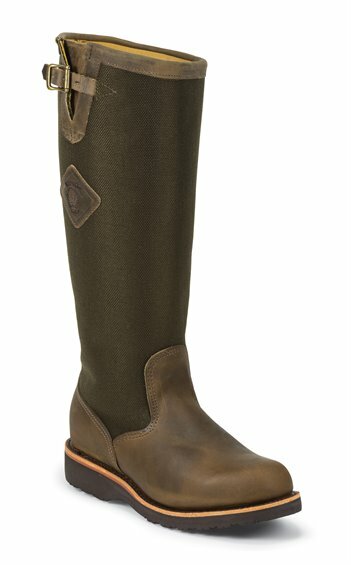 The Yarrow Olive Green 17-inch tall men's boot features an olive green woven upper with our unique Espresso Rattlesnake® leather vamp and collar. This boot provides maximum protection by combining thickness of leather and lining in order to withstand the strikes of venomous snakes. It has Texon® Flexwelt® insoles that provide a flexible and comfortable fit and allows for freedom of movement on the trail and a triple ribbed steel shank for stability. The Vibram® outsole offers traction on wet and dry surfaces as well as various terrain so this boot can go anywhere. Made in the USA with global parts.